This smartwatch can display current heart rate data, notifications, calls, steps, calories, and other important things. As you exercise, this watch automatically monitors more than 10 different activities like swimming, walking, jogging, running and many more. It is water-resistant to over 160 feet plus it has a Steel HR that will not stop tracking your heart rate during exercise to help improve your training. It requires you to charge it daily. The screen is small but still visible enough. When it’s dark, this watch tracks your sleep too. It even has a silent, vibrating alarm to wake you from a deep siesta. Fossil is no newbies when it comes to discussions as regards watches. The company offers different kinds of hybrid smartwatches to the general public. It has an analog window at the bottom that informs you about your daily steps, distance covered, and calories burned. It’s also water-resistant up to 165 feet. You need not bother your head about charging this watch because its replaceable battery can last for up to 365 days. As you receive a call, SMS, or phone update, this smartwatch will alert you as soon as possible. It works great with all 22mm watch straps so you can flaunt your own unique style. Alongside its unchanging heart rate monitoring, this smartwatch offers extra features like Vo2 maximum and a fitness age. It goes as far as monitoring your stress levels. Immediately you are alerted about going beyond the limits your body has permitted you, it is best to take time out to rest. Must Read: Do You Even Need A Smartwatch in 2019? Looking at the bottom of this smartwatch, you can view your heart rate data and other things. It turns itself on as soon as you quickly turn your wrist to look at the watch. To dazzle you, the watch hands make way when you viewing the screen and returns with the correct time when you are done. You’ll know the hybrid smartwatch bandwagon is one to join when fashion companies decide to be part of the fun. This smartwatch is for females and it features a petite 39.5mm case and 19mm strap. It has no screen or separate dial, so you’ll be viewing your steps and other important info like sleep in the companion smartphone app. Kate Spade Metro has a magnificent battery life of up to 24 weeks with a replaceable cell and it receives notifications in a special way. Another feature to be excited about is its countdown display to a customizable special event like a wedding, vacation, or other key celebrations. With up to six months of battery life, this is another excellent option. Users get to customize the four small colors on the left side of the watch so whenever you receive a notification, call or text from someone, the face hands will quickly change to a different color. For instance, as you receive an SMS, you have the opportunity to select the hands to point to green. This watch can also track your sleep. There you have it. 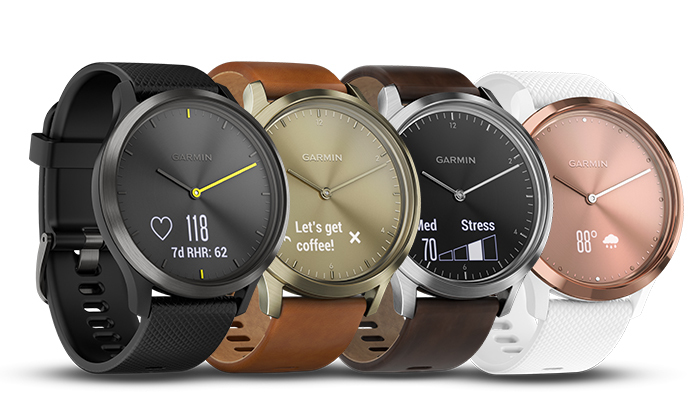 The smartwatches listed above are the best hybrid smartwatches for fitness and notifications. if you have other recommendations, feel free to drop them in the comment box below.